"The audience was quite impressed by guitarist George Hadjimarkou's excellent guitar arrangement ... which he performed with unrivaled sensitivity and faultless technical perfection." "... an excellent, formally trained, multitalented and extremelly versatile musician ..."
"... a dedicated teacher and an impressive performer. It is obvious that he is devoted to his art and has the extraordinary ability to convey that to his students." "CD: Sinopsi. I very much enjoyed listening to it, and have been sharing it with my friends and colleagues. Personally, I enjoy "I Foni Tis Lismonias" and think you have an excellent singing voice. Also, I found your setting of "Piano" by D.H. Lawrence to be quite interesting. Your compositions are filled with unexpected yet choice harmonies. But I think everyone, including myself, to be intrigued by "To Yiasemi" as we don't hear much Cypriot music, and it was a fresh sound to our ears." 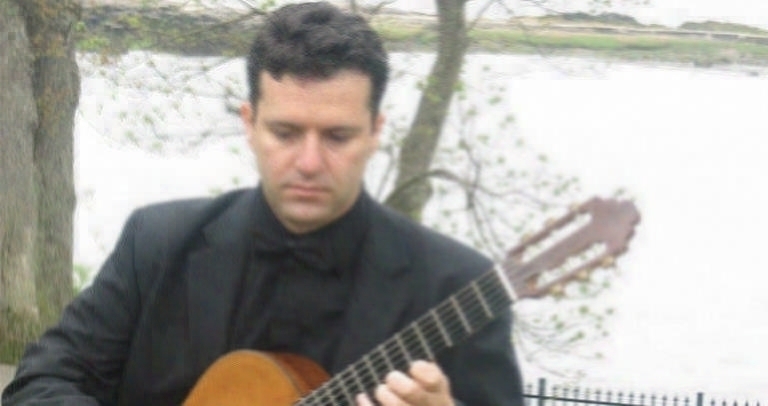 "George Hadjimarkou, a new exciting face on the classical guitar scene gives a free of charge recital with works by Bach, Brouwer and Villa Lobos." “…it was a rare experience that we had the chance to enjoy for the very first time in Cyprus. Mathematics, philosophy…connections, theories, ideas and achievements from ancient years to present, an essence of human culture. All these belong in logical rules and can be automatically translated in sound – symbols. In contrast to “conventional” music which doesn’t need explanation and you just enjoy it, this music creates an irresistible urge to seek, to “dig deeper”, a thirst to discover what is hidden behind every sound. The bet seemed difficult for the participants…However, as a mathematical theorem which happened by mistake, everything seemed to function smoothly and the spirit of the big experimenter sounded in every single corner of Strovolos’ Municipal Theatre, offering a satisfying dose of “stochastic music”. An unforgettable experience for the participants. It was well worth the effort. CD: Famagusta Odes, “The 14 songs on the new CD by George Hadjimarkou, flows lyricism, nostalgia and desire for return in a reunited Cyprus... unfolds the folds of the soul of a refugee who, for 43 years looks from afar Famagusta without being able to return. A refugee in his own place that has left his heart forever, in the neighborhoods he walked as a child and felt the first of fads. The music of George Hadjimarkou, portrays an unrequited love and a hope that remains forever alive. Hope, peace for reunification of our afflicted island." For upcoming events please check my page on Facebook! Copyright © 2008 George Hadjimarkou. All rights reserved.